Information you provide voluntarily via our online forms is kept in the strictest confidence and is intended for use by Ragan Design Group or Ragan Design Group suppliers as may be needed. We ask for your name, address and contact information so we can send you your order or responde to your request for information, and so we can contact you if we have a question about your order or request. Credit card information may be supplied to the company or companies who process your credit card payment. We may share your name and address with other companies whose products we think you may be interested in. We do not share any other information with third parties, except in the case of contact or order information needed to fulfill your order or answer your request. We do not share or sell email addresses. Occasionally we might provide links to other sites we think you will find useful. 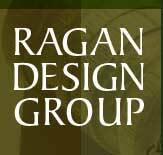 These sites are independent of Ragan Design Group and should have established their own privacy and security policies. You should review the privacy policies of these sites before providing them with your information. For questions, comments or assistance with any privacy-related issues, we invite you to contact us at info@ragandesign.com. Communications with Ragan Design Group: You consent to receipt of electronic communications from Ragan Design Group, and agree that all agreements, notices, and other disclosures communicated to you by Ragan Design Group electronically (whether by electronic mail, by posting at this web site, or by other electronic means) satisfy any legal requirement that such communication be in writing. Your communications with Ragan Design Group, including transmission of order requests, submission of testimonials, or the uploading of images, constitute electronic communications. You grant to Ragan Design Group a perpetual, irrevocable, worldwide, non-exclusive, transferable, royalty-free right to use all information and materials that you submit to us, including the right to exercise copyright and publicity rights, in any media, in connection withRagan Design Group web site. a. YOUR USE OF THIS WEB SITE IS AT YOUR OWN RISK. ANY FEATURES AVAILABLE THROUGH OUR WEB SITE ARE PROVIDED TO YOU ON AN “AS IS” AND “AS AVAILABLE” BASIS. Ragan Design Group EXPRESSLY DISCLAIMS ALL WARRANTIES OF ANY KIND, WHETHER EXPRESS OR IMPLIED, INCLUDING, BUT NOT LIMITED TO, THE IMPLIED WARRANTIES OF MERCHANTABILITY, FITNESS FOR A PARTICULAR PURPOSE, TITLE, AND NON-INFRINGEMENT. Because our web site is provided to you “AS IS,” you agree that Ragan Design Groupshall not be liable to you or to any third party for any delay in delivery of, or failure to deliver, any of your communications or other information you submit using our web site. Because our web site is provided to you “AS AVAILABLE,” you agree that Ragan Design Group shall not be liable to you or to any third party for any modification, suspension, or discontinuance of the Ragan Design Group web site or of your ability to access it. b. Ragan Design Group also disclaims any warranty that (i) our web site will meet your requirements, (ii) our web site’s operation will be uninterrupted, timely, secure, or error-free, and (iii) any information or communication that may be obtained from the use of our web site will be accurate or reliable (and Ragan Design Group disclaims any liability for damages that may arise from your reliance on any such information or communication) or are free of viruses or other harmful components. c. You assume the full responsibility and risk for any damage to your computer or other consequences that result from your downloading any information, software, or other materials through our web site. Ragan Design Group shall have no liability for any damage to your computer, including loss of data, that results from your downloading any such materials. d. Ragan Design Group shall not be responsible for any order request if it is received in an unintelligible or garbled form. However, Ragan Design Group will make reasonable efforts to notify the sending party (if the sending party is identifiable from the received order request) that the order request was unintelligible or garbled. Some states do not allow the disclaimer of implied warranties, so this provision may not apply to you. Limitation of Liability: YOU AGREE THAT Ragan Design Group SHALL NOT BE LIABLE FOR ANY DIRECT, INDIRECT, INCIDENTAL, SPECIAL, CONSEQUENTIAL, EXEMPLARY, OR PUNITIVE DAMAGES, INCLUDING, BUT NOT LIMITED TO, DAMAGES FOR LOST PROFITS OR LOSS OF GOODWILL, USE, OR DATA (EVEN IF Ragan Design Group HAS BEEN ADVISED OF THE POSSIBILITY OF SUCH DAMAGES), THAT RESULT FROM: (a) YOUR USE OF OR INABILITY TO USE Ragan Design Group WEB SITE; (b) THE COST YOU INCUR TO SUBSTITUTE FOR ANY GOODS YOU PURCHASED THROUGH Ragan Design Group WEB SITE; (c) ACCESS TO OR ALTERATION OF YOUR PERSONALLY-IDENTIFIABLE INFORMATION OR OTHER INFORMATION IN AN UNAUTHORIZED MANNER; (d) REPRESENTATIONS OR CONDUCT OF ANY THIRD PARTY RELATED TO THE Ragan Design Group WEB SITE, INCLUDING OUR ADVERTISERS AND BUSINESS PARTNERS; OR (e) ANY OTHER MATTER RELATING TO THE Ragan Design Group WEB SITE. Some states do not allow the limitation of liability, so this provision may not apply to you. Intellectual Property: The content that Ragan Design Group provides on our web site, including, but not limited to, text, graphics, images, and logos, is owned by either Ragan Design Group or the party that has provided the content to us and is protected by U.S. and international copyright laws. Ragan Design Group is the sole and exclusive owner of its compilation of this content on our web site, and this compilation is also protected by U.S. and international copyright laws. Unpermitted copying of any of this content could lead to copyright infringement. Ragan Design Group, and other logos, slogans, and product and service names used on this site are trademarks owned by Ragan Design Group, its subsidiaries, or its affiliates. You agree not to display or use such trademarks, in any manner, without the written permission of Ragan Design Group. Trademarks and trade names of third parties are the property of those third parties, and are used by Ragan Design Group subject to license, or subject to the fair use provisions of U.S. trademark law. Ragan Design Group will not be liable to you or be deemed to be in breach of its obligations hereunder for any delay or failure in performance caused by acts beyond Ragan Design Group reasonable control, including, without limitation, acts of God, war, terrorism, accidents, fires, floods, strikes, labor disputes, mechanical breakdown, shortages or delays in obtaining supplies, materials, labor, or transportation, interruption of utility services or the Internet, acts of any unit of government or any governmental agency, or any similar or dissimilar cause.